Bruce Wolf is a veteran Chicago sports anchor who has been on both TV and radio for more than 20 years. He claims to have started his career in the 1940s working as a sound effects man on the radio who made the sound of Jack Benny’s trouser legs rubbing against each other as Mr. Benny sashayed across the stage. But this claim is somewhat doubtful. Also questionable is Mr. Wolf’s claim that he moved to the Soviet Union in the 1950s but was blacklisted because he was a member of the Republican Party. More likely is his claim that he first started working full-time for the Lerner Newspaper from 1972 to 1981. He then joined WXRT radio in 1979 where he did morning sportscasts. 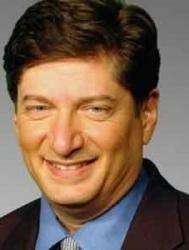 In 1982 he joined WLUP Radio also doing sportscasts. While working for WLUP, Wolf created a character named "Chet Chitchat", a blended caricature of Chicago sportscasters Chet Coppock and Chuck Swirsky, his predecessor at WLUP, which became a weekly feature on the station's morning program. In 1987 Wolf joined WFLD FOX News Chicago, where he became the morning sports anchor. While working for FOX he received three local Emmys. After 18 years working for WFLD-TV, Wolf joined WMAQ-TV (NBC 5) where he has worked as the host of “Barely Today,” an irreverent news program and as a sportscaster. Wolf also works on occasion for WGN radio. Wolf is known for his unique brand of humor while reporting stories. Wolf, who is also an attorney, studied journalism at Northwestern University and also earned a law degree from Chicago-Kent College of Law . Wolf lives in the northern suburbs of Chicago with his wife and children . What do you get when you hire Bruce Wolf for your next event? 1) Bruce Wolf will research the group he is speaking to (talk to leaders of the group, etc.) so that his presentation could be customized to the group and even to individuals who will attend. He likes to interact with the audience. 3) To keep it light, Bruce also can tell some stories of his professional experience, ranging from the time he almost disabled Michael Jordan to the time he helped wreck Michael Jordan's baseball career. He even has stories that don't involve Michael Jordan. 4) He does have video which can be sprinkled in small doses (from his days at fox) of him "wrestling" with Jamie Lee Curtis, boxing a female traffic reporter (with Jerry Springer as the referee) and presenting an on-the-street sportscast with Magic Johnson. See, he told you it's not just about Michael Jordan. 5) There's also video of him doing a satellite interview with Paul McCartney, where he authenticates his signature on letters he sent his kids. 6) Bruce has stories about his brief career as a lawyer, including his first trial, where he had no idea what he was doing. 7) He can actually provide karaoke (courtesy of my son the deejay, brad) and can use it as a threat against hecklers in the audience. "Heckle him and you have to come up and sing a song!" 8) He can play games with the audience and ask trivia questions involving their organization and other topics. 9) He can be a celebrity auctioneer and entertain and work the crowd.